How Many Words for Snow Do Eskimos Really Have? Travis P. asks: Is it true that Eskimos have dozens of words for snow? It’s impossible to say precisely how many words for snow certain native peoples of the far north have. Why? To begin with, we are talking about a group of related languages, not just one, and even within these languages there are variations from specific region to specific region. Much more important to the discussion at hand, it depends on how you categorize what constitutes different “words” in the polysynthetic group of Eskimo-Aleut languages. (And yes, when speaking of these different groups’ languages broadly, the generally accepted term for the larger branch (as opposed to Aleut branch) is “Eskimo,” not something like “Inuit,” for a variety of reasons, though this does vary a bit from region to region). As for what the general opinion of the linguist community is on the “snow” question, most do not consider any of the Eskimo-Aleut languages to have more than a couple dozen distinct words for snow, which just so happens to be more or less what English and many other languages have. But even if you happen to be in the extreme minority “many words for snow” camp on this one, it would always be incorrect to affix any specific number here because the number of technically valid “word” constructions for snow in any of the Eskimo-Aleut languages is limited only by the speaker’s imagination. Confused? Read on! All of these languages (with Yupik and Inuit being the best known) are polysynthetic – meaning new words are formed by starting with a base word and then adding (sometimes numerous) suffixes, often called postbases. For example, the Siberian Yupik word for “boat” (angyah) is a base word to which suffixes may be added to create other meanings, such as angyaghllangyugtuqlu. (“What’s more, he wants a bigger boat!”) Some consider the two preceding boat-related strings of letters as separate words, while the vast majority of linguists classify only the first as a distinct word, with the second, at least in this specific example, more like a sentence. Note, too, that the root tla- is also the base for: Powder snow (tlapa); Crusted snow (tlacringit); and Snow mixed with mud (tlayinq). It should also be mentioned that many “words” often credited to snow in these cases only refer to snow in the correct context. For instance, maujaq in Nunavik might mean “the snow you sink in,” but it also might mean “the mud you sink in” or any other such soft ground you sink into. 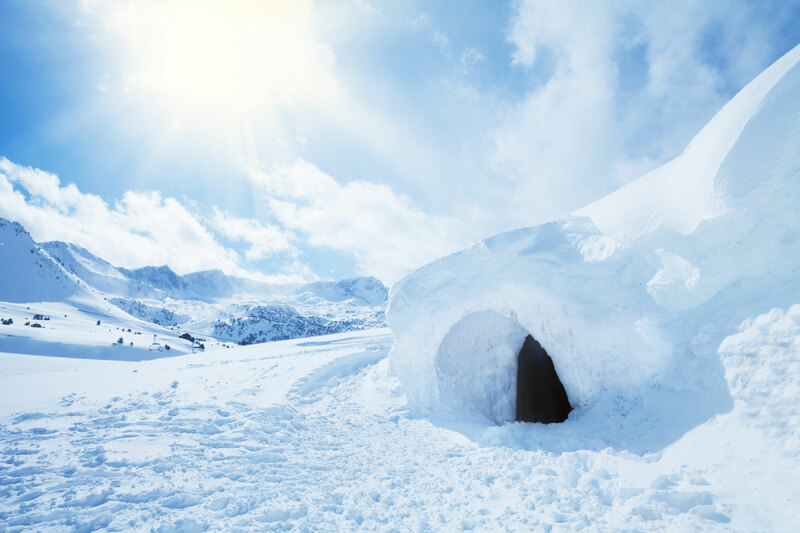 Similarly, the Inuit igluksaq might mean snow used to construct an igloo, but it can just as well refer to any construction material you use to build a house at all (iglu: “house” and –ksaq: “material for”). Thus, it could refer to something like wood or stone or even nails and drywall. Despite this, many-a-list that posits that “Eskimos” have “hundreds of words” for snow will include these and other similar terms on the snow ledger simply because they may refer to snow in the right context. So while you might hear from those supporting the “many words for snow” stance that the Inuit dialect of the Nunavik in Canada has “53 words” for snow and the Central Siberian Yupik language has at least “40 words” for snow, in truth in both languages one could come up with an unbounded number of words related to snow not unlike how in English you could come up with an unbounded number of sentences or phrases that describe something to do with snow. The commonly touted rationalization for why these various northern groups supposedly have so many words for frozen water is that many things related to snow are life and death for them, so they need these singular words to convey a lot of meaning without bothering with full sentences. But as you might have guessed if you’ve been paying attention, there’s nothing particularly unique about “snow” in these languages. A similarly unbounded number of “words” can be constructed to describe pretty much anything from coffee to suntan lotion if one put their mind to it- the point being here that, contrary to what is often said when this “fact” is brought up, these languages do not have any superior descriptive ability when speaking of snow than most other languages. For instance, in English, we might just use a noun phrase or the like instead of building up a singular “word” with postbases. This is somewhat similar to English where we might describe snow or how snow has (or is) accumulating as sleet, snow, flurry, powder, hardpack, blizzard, slush, whiteout, drift, etc. Beyond these, if you’re of the “many words for snow” camp in Eskimo-Aleut languages, on the English side you’ll have to also include things like snowy, snowier, snowiest, snowed, etc. and similar versions of other words for variants of snow. You’d also have to include things like snowball, snowbank, snowcapped, etc. and their many variants. Unsurprisingly, the vast majority of linguists fall in the “few words” camp here and do not think there is anything special or significant about the number of words for snow in the Eskimo-Aleut languages. Given this, at this point you might be wondering where the widely spread rumor that our friends from the north have countless words for snow got started in the first place. This has its genesis in Franz Boas’ 1911 work The Handbook of North American Indians, though he never actually said this. He merely discussed certain roots for “snow” in Eskimo-Aleut languages and how it was interesting that some of these words had such distinct derivations, not unlike how in English the words for “lakes” and “streams” do not derive from “water”- Boas was simply commenting on this curiosity of evolution of language. We have the same word for falling snow, snow on the ground, snow packed hard like ice, slushy snow, wind-driven flying snow — whatever the situation may be. To an Eskimo, this all-inclusive word would be almost unthinkable; he would say that falling snow, slushy snow, and so on, are sensuously and operationally different, different things to contend with; he uses different words for them and for other kinds of snow. Beyond the obvious problems with his characterization of the number of distinct words English has for various types of snow and snowfall, his leap that an “Eskimo” would find a supposed single term for snow to be used “whatever the situation” “almost unthinkable” isn’t correct and isn’t in the slightest bit supported by Boas’ 1911 work which was his source, proving, as always, that Mr. W(h)orf’s opinion is always wrong. Was John F. Kennedy’s Statement “Ich Bin Ein Berliner” Really Interpreted as “I am a Jelly-Filled Doughnut”? I think my experience is worth noting. Working for Alaska Airlines in Chicago one day I saw a fellow who looked to me to be 100% Eskimo. When I told him i had never had a chance to meet or talk to a real Eskimo he let me know in NO uncertain terms that my ignorance simply overwhelmed him. I was taken aback and embarrassed as he explained that the word “Eskimo” is the equivalent of using the “N” word when referring to black people. Of course I apologized profusely. Still i wonder if i was so completely stupid as to not recognize a racial slur or if something else was at play. What say you? I met many Native Americans in Alaska, but I don’t think I called anyone Eskimo. They were Aliutes, being in the Islands, so I don’t rightly know. But just guessing, I would say that Nanook of the North had a huge reindeer chip on his shoulder. Of course, “Inuk”, plural “Inuit” doesn’t mean “Eskimo”. It means “person” or “human being”. The rest of us, I suppose, are not human. Apart from that, I wonder whether Eskimos have as many words of water-going vessels as are found in English, the language of an island people. English has three basic words: ship, boat, and raft. However, there are innumerable sub-groups: dinghy, ketch, sloop, schooner, trawler, liner, freighter, collier, yacht, and many, many more – quite apart from the terms for warships.